Tharoor was admitted on Monday, and is expected to be discharged later Tuesday. 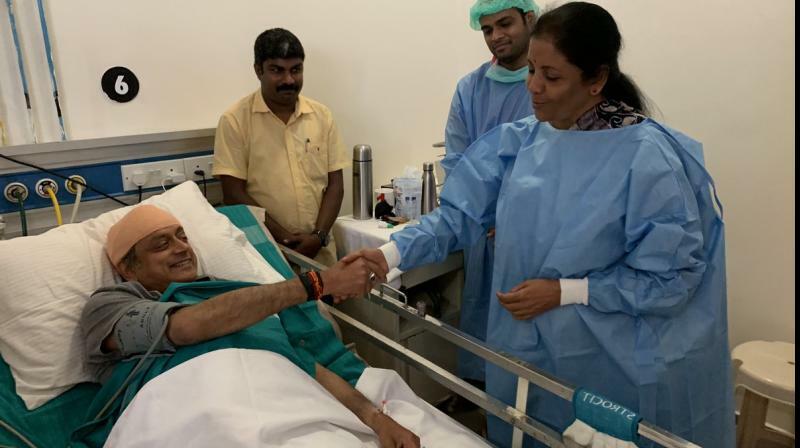 Thiruvananthapuram: Defence Minister Nirmala Sitharaman Tuesday called on Congress leader Shashi Tharoor, who is in hospital after suffering head injuries while performing a ritual at a temple here. He was admitted to the Thiruvananthapuram Medical college hospital Monday, and is expected to be discharged later Tuesday. The former union minister later tweeted, "Touched by the gesture of @nsitharaman, who dropped by today morning to visit me in the hospital, amid her hectic electioneering in Kerala. Civility is a rare virtue in Indian politics - great to see her practice it by example!". Divakaran asked Tharoor not to be demoralised,. "I'm not: I'm more determined than ever to see this through!," Tharoor said.